While the most common thermoplastic material used for plastic rotational molding is polyethylene, other materials include polypropylene, polyvinylidene fluoride, nylon and polyvinyl chloride. These plastics are exposed to high heat and therefore must exhibit good thermal stability. To enhance properties like flame retardancy, water and chemical resistance as well as the ability to withstand extreme temperatures, many resin powders contain additives, which can also alter the color, texture, finish and appearance of the cured plastic’s surface. Plastic rotational molding is an alternative to blow molding, injection molding and thermoforming, but is not as common because of the large, expensive machinery that is used to form the products. Still, this molding process is used within the sporting goods, waste water management, marine, pharmaceutical, construction, toy manufacturing, food and beverage processing, chemical, plumbing, agricultural, furniture, packaging and material handling industries, among others. Rotomolded products include safety cones, plastic tanks, footballs, helmets, kayaks, playground slides, pipe fittings and outdoor planters. 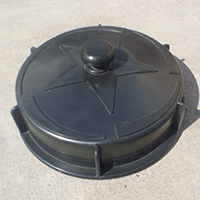 The plastic rotational molding process starts with mold fabrication via welding, for simpler designs, or die casting, for more complex constructions. The molds are made of stainless steel, aluminum or a combination of both, when wall thickness is not intended to be uniform. The plastic rotational molding machine is composed of a series of different molds, which are mounted on rotating spindles, which revolve on one or two axes. The polymer resin powder, which must be very fine in order to coat all areas of the mold, is then poured. The plastic rotational molding machines are then transported to an oven chamber while they continuously revolve. Once under high heat, the powder melts and evenly covers the mold walls. Next, it travels to a cooling chamber, which uses a combination of cold water and air to cure the plastic. This takes about 20 minutes. Once the plastic has fully dried, the molds are manually unloaded, which can be difficult if the plastic shrinks. Right out of the mold, rotomoulded products are hollow parts without any openings or holes; they must be cut out if needed. The plastic is often cleaned, polished, painted or welded with small components as final post-forming fabrications. Plastic Rotational Molding Plastic rotational molding is a thermoplastic fabrication technique that manufactures hollow products by using heat and a revolving metal mold. Rotomolded products are seamless, uniform in wall thickness and of single construction, which eliminates costly fabrication processes and the need for replacement parts.